Woodpeckers are a family of birds -- the Picinae subfamily -- known for their knock-knock-knocking on wood and their ability to climb tree trunks vertically. During breeding season, male woodpeckers drum on tree trunks and utility poles to attract females. Flickers are members of the woodpecker family. They are named for the brilliant yellow or red undersides of their wings and tails that cause the birds to resemble flickering flames when they fly. Northern flickers display two color schemes. Flickers found in the eastern United States are called yellow-shafted flickers due to the yellow coloration on the undersides of their wings and tails. Male yellow-shafted flickesr display black moustache markings on either side of their bills and slashes of red across the backs of their heads. Red-shafted flickers are found in Western North America and have red under their wings and tails. Male red-shafted flickers have red moustache marks and do not have red marks on the backs of their heads. The females of both color phases resemble the males but do not have the moustache markings. Both types of northern flickers have striped backs and spotted under-parts highlighted by black crescent "bibs" at their throats. The red and yellow color phases are known to hybridize; the resulting young have varying combinations of markings from both color phases. Many woodpecker species cling to tree trunks and spiral around them as they peck into and beneath bark and trunk to find insects and insect larvae. Woodpeckers also eat fruit, nuts and seeds and often visit bird feeders, where they consume seeds and suet. Flickers are primarily ground-feeding woodpeckers. They hunt for ants and other subterranean insects using their feet and strong bills to dig and remove insects from the ground. 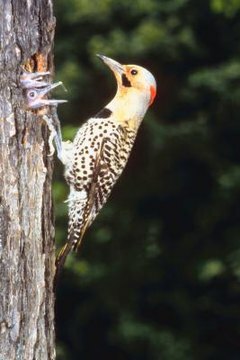 Like other woodpeckers, flickers eat fruit, nuts and seeds, and often visit bird feeders to consume suet and seed when insects are not available. Unlike other woodpeckers, flickers typically migrate south when inclement weather arrives. In the spring, they establish nesting territories, and males drum on trees, utility poles or other objects to warn away other flickers. Flickers sometimes use unusual objects for drumming; they seek objects that make the most noise. Flickers often drum on metal roofs and farm equipment to create maximum noise. Flickers nest in hollow trees and behave as other woodpeckers do if their nest cavities need to be enlarged. Their sturdy bills enable both male and female flickers to prepare their nest holes quickly. Unlike other woodpeckers, flickers reuse nest cavities from prior years. Flickers typically perch horizontally across branches rather than travel up and down tree trunks like other woodpeckers. Northern flickers are stocky birds larger than most North American woodpeckers that range in size from 6 to 8 inches long. While populations of flickers are declining in North America, they are not considered at risk. This isn't the case for woodpecker species including the redheaded woodpecker, which is considered nearly threatened in the United States, and the ivory-billed woodpecker, which was considered extinct until a specimen was seen in Arkansas in 2005.